Zhang Guo Lao (張果老) (Chang Kuo Lao in Wade-Giles) is one of the Eight Daoist Immortals who is generally thought to have lived during the Tang dynasty (618-907 C.E.). His proficiency at various magical arts is well known, to the extent that he was allegedly given the title "Master Comprehension-of-Profundity" (通玄先生, Tōngzhào Xiānshēng) by a Tang emperor. In iconographic depictions, he is most easily recognizable by his mode of conveyance (a white donkey), which he is often seen riding backwards. He is the most eccentric of the Eight Immortals, as one can see from the kung fu style that was dedicated to him—a bizarre set of techniques that includes moves such as delivering a kick during a backflip or bending so far back that your shoulders touch the ground. 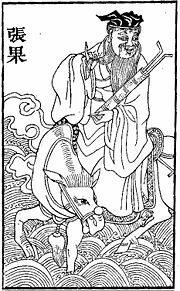 Zhang Guo is one of the illustrious Eight Immortals (Ba Xian), a group of Daoist/folk deities who play an important role in Chinese religion and culture. While they are famed for espousing and teaching Daoist philosophy and cultivation practices, they are also figures of popular myth and legend that are known for their devotion to the downtrodden and their collective lifestyle of “free and easy wandering.” Though they are most often depicted and described in the context of their group, each has their own particular set of tales, iconography, and areas of patronage. Unlike many of the immortals, most tales of Zhang Guo's exploits refer to the time after his ascension to the ranks of the xian. It is said that Zhang Guo began his life as an impoverished peasant youth, helping to support his family and attempting to maintain their ramshackle farm. He was often given the task of taking their produce to market, selling it, and returning home with the meager profits. One day, as he trekked back to the family homestead, he stopped for a mid-afternoon nap at an abandoned monastery. When he awoke, he was surprised by a delicious aroma wafting from a corner of the temple grounds. Stomach churning with anticipation, Zhang Guo and his donkey rushed over and found, to their delight, a small cauldron filled with a bubbling quantity of stew. Assuming this unexpected windfall to have been a gift from the gods, the young man, fashioning a pair of crude chopsticks from twigs, immediately began to devour it. After satiating his appetite, he even fed a bit of the stew to his long-suffering donkey. Little did the future immortal know that this unexpected lunch was, in fact, an exceedingly rare potion of immortality that a local adept had been preparing for himself. By the time the unfortunate alchemist returned, the young man (and his donkey) had already become divinized. Later in his life, Zhang Guo became renowned throughout the land for his immortality, magical prowess and personal cultivation. In fact, by the time of Empress Wu, he was thought to be several hundred years old. He was also famed for helping the poor and instructing the spiritually-minded, often traveling over a thousand miles per day on the back of his magical donkey. Given these skills, it is perhaps unsurprising that the reigning emperor wanted the immortal to take a role in his government. To that end, he sent out an emissary to visit the xian at his residence. However, no sooner had the envoy arrived then Zhang Guo abruptly died. Seeing the immortal's festering and maggot-riddled corpse, the imperial emissary had no choice but to return to his master empty handed. However, Zhang Guo was not dead, and continued his altruistic work throughout the countryside. When news of this reached the emperor, he realized that he had been tricked and that he would need a more subtle approach if he wanted to convince the spiritual adept to visit the imperial court. Thus, he contacted Fei Wu, one of the immortal's friends, and asked him to attempt to change his compatriot's mind but as soon as Fei brought the matter up with Zhang Guo, the immortal promptly ceased breathing and died. Stricken with grief, the friend wept and gnashed his teeth, apologizing for ever raising such an issue with him. The immortal abruptly began breathing again and forgave his friend for the transgression. Eventually, Zhang Guo Lao did agree to visit the palace, after obtaining a promise that he would not be pressured to join the bureaucracy. While there, he entertained the emperor with various magical feats (including drinking poison, becoming invisible, and charming birds from the trees), but refused to talk about himself or about spiritual matters. Becoming increasingly curious, the emperor summoned Fa Shan, his magician (or, in some cases, a Buddhist monk), in an attempt to discover the immortal's secret. "I know it," replied the magician; "but if I were to tell your Majesty, I should fall dead at your feet for revealing one of Heaven's secrets, so I dare not speak unless your Majesty will promise that you will go with bare feet and bare head to ask Chang Kuo [Zhang Guo Lao] to forgive you, in which case I should immediately revive." The Emperor having consented, Fa-shan said, "At the time when cosmos was being evolved from chaos, the spiritual essence of a white bat . . ."; the sentence was broken off unfinished, for blood gushed from his seven channels of sense, and he fell prostrate upon the ground. The Emperor hurried to Chang Kuo's [Zhang Guo Lao's] abode, where he removed his cap and bared his feet, and declared that he himself was the one to blame. Chang Kuo calmly replied: "That young fellow talks too much. If I allowed him to go without punishment, I fear he might divulge the secret of the universe." The Emperor having again and again implored forgiveness, Chang Kuo squirted water from his mouth over the face of Fa-shan, who forthwith came to life again. Following this display of mystical potency, the emperor was shamed and agreed to honor the immortal, but never to trouble him again. This account, much like the tales of Lan Caihe and Li Tieguai, contains definite reference to the point-of-view espoused in the Zhuangzi, specifically its anti-political stance. Just as Zhang Guo Lao would rather die (or feign death) than use his powers in the service of the bureaucracy, Zhuangzi, making reference to a jeweled tortoise shell housed in the palace, argues that he would rather "drag his tail in the mud" than (metaphorically) die in the service of the state. In this way, the tales of this particular immortal can be seen as an implicit critique of Confucianism, a school of though known for arguing that one's truest moral and personal perfection can be found in the service of the emperor. In artistic depictions, Zhang Guo Lao is typically portrayed as an elderly man astride a white donkey (which he is sometimes seen riding backwards). He often bears an archaic Chinese instrument instrument called a "fish-drum." Though the token elderly member of the Eight Immortals, Zhang Guo Lao is not generally seen as a patron of the elderly. In fact, he is often seen as a protector of young families and a bringer of male children, which is why nurseries are often decorated with images of him Also, Zhang Guo had a legendary love for wine and winemaking, making him an unofficial patron of all such endeavors as well. ↑ Ho and O'Brien, 118-119. In another version, Zhang Guo Lao becomes immortal after finding a superhuman donkey and chasing an immortal unicorn through the cosmos. A strength of this version is that it explains why the immortal is always portrayed as an old man: during the days that he spent in the world of immortals, years had been going by on earth. See Ho and O'Brien, 122-127. ↑ In addition to its great celerity, Zhang Guo's mount was also highly portable: virtually all accounts describe how he could fold it up (like a piece of paper) and place it in his pocket until he needed it again. See Yetts, 284; Kohn, 164. ↑ Versions of this tale can be found in Werner, 346-347; Wong, 23-25; Ling, 65-66; Yetts, 784-788. ↑ Zhuangzi, Chapter 17 (Watson, 109). ↑ Goodrich, 313; Yetts, 784; Ho and O'Brien, 26. ↑ Alluded to in Yetts, 786. Watson, Burton (trans.). Chuang Tzu: Basic Writings. New York: Columbia University Press, 1996. History of "Zhang Guo Lao"
This page was last modified on 3 July 2013, at 16:04.